Nokia C6 priced at Rs.15,200 in India is the latest launched smartphone from Nokia mobiles.The Nokia C6 is smartphone with slider and many cool social networking features. It is look alike of the Nokia N97 Mini,a Nokia smartphone released sometime back in 2010. The Nokia C6 comprises of a Qwerty keypad with buttons arranged in three consecutive rows below its 3.2 inch wide touchscreen. The looks, design and form of Nokia C6 is quite an improved one over its predecessor as its internal memory is which now stands at 200Mb. The Nokia C6 is light weight, just 150 grams and has an impressive built-in 5 megapixel camera with autofocus, Carl/Zeiss lens and flash support. Other connectivity features are HSDPA 3G support and UMTS, Wi-Fi and Bluetooth connections. Nokia E5 price in India is Rs.12,699 officially and it is now launched in the country. The E5 launch was announced besides Nokia C3 and Nokia C6 few months back and has launched with Nokia C6 now. 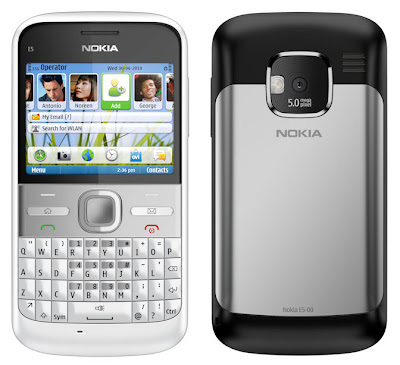 The Nokia E5 is economically priced stylish smartphone with QWERTY keypad and runs on Symbian OS. It also comprises of 5 MP Camera and abundant connectivity options viz. 3G, Wi-Fi , Bluetooth and its specifications indicate a GSM talk time of 13 hours. Its display is 2.4 inches and displays 256k colors. The very light weighted Nokia E5 is just 126gm light and is available in Carbon Black, Chalk White, Sky Blue, Copper Brown and Silver Grey colors. To keep its users entertained, it offers stereo FM radio with RDS and in built MP3 and MP4 player. The musical effect is augmented via its inherent stereo speakers and an audio jack of 3.5mm. The Nokia E5 facilitates capturing of videos that can be easily stored in its internal memory of 250 MB storage and the card slot is microSD (TransFlash), up to 32GB. It also gives ample space for assimilating data as in videos, music files and documents. The Nokia E5 has the basic wireless connectivity via WLAN is in the configuration of Wi-Fi 802.11 b/g, DLNA. All the other advanced messaging and connectivity features are incorporated in Nokia E5. These are SMS, MMS, Email, Push Email and IM and Bluetooth, GPRS/EDGE. The handset is 3G enabled with HSDPA 10.2 Mbps; HSUPA 2.0 Mbps. Nokia E5 navigation is enabled with A-GPS support with free Nokia Ovi maps. 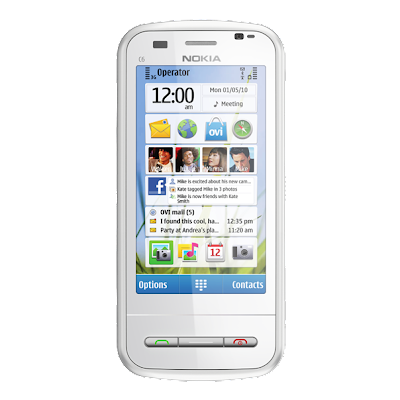 There are productivity applications from Nokia's online Ovi Store, networking and entertainment capabilities in Nokia E5.